The judge in former Illinois Gov. Rod Blagojevich's corruption trial has read a note from jurors asking for a transcript of some testimony. In the note sent Monday, jurors asked for the testimony of former deputy governor Bradley Tusk. Tusk's testimony included saying that Blagojevich had planned to hold up a $2 million grant to a school in then-U.S. Rep. Rahm Emanuel's district until the congressman's Hollywood-agent brother held a fundraiser for him. "I believed doing that would be both illegal and unethical," Tusk testified. Instead, he called Blagojevich's attorney, Bill Quinlan, and told him "we should put a stop to it," reports CBS Station WBBM in Chicago. Tusk's testimony will have some portions blacked out before it is sent to the jury - so that they will not see anything that Tusk said while jurors were not in the courtroom. After hearing objections from defense attorneys, Judge James B. Zagel granted the jurors' request but also said they should make their own assessment of Tusk's credibility. It wasn't immediately clear how soon jurors would receive the transcripts. Jurors had returned to court Monday for their 13th day of deliberations. They created a stir last week with a note to Zagel signaling they're stuck on several of the 24 counts against Blagojevich. They say they've agreed to only two. Zagel told them to deliberate further on wire fraud counts that they had not considered. 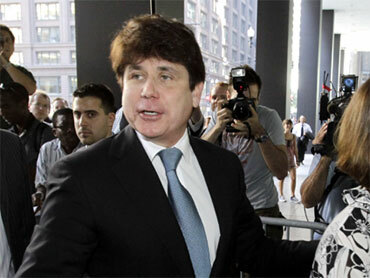 Blagojevich has pleaded not guilty to charges including that he tried to sell President Barack Obama's old Senate seat and tried to leverage the power of his office for personal gain.